The leading piano of the 21st century is an amalgam of diverse elements woven gracefully into a complete work of art. To achieve completeness, the craftsman must skillfully meld the technological advances of the present and the honored traditions of the past into an expressive form that can communicate with eloquence, empathy, beauty and passion. 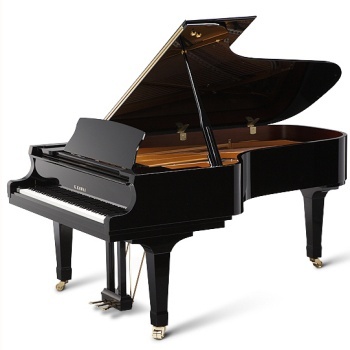 Introducing the GX BLAK Series, grand pianos that are fully traditional and fully modern. Inspired by our methods of origin, the time-honored techniques of the piano craft acquired over decades of passionate striving, they are completed by our visionary commitment to technological mastery. For over forty years, Kawai has been the originator of the modern piano, boldly pioneering the use of state-of-the-art materials and ideas to advance the piano art form. This innovative spirit is the essence of Kawai, and the principal reason why the GX BLAK Series grand pianos can be relied upon to provide exceptional performance that endures. At the lofty pinnacle of the GX BLAK Series, the regal GX-7 BLAK speaks with the transcendent character and authority that has made it the definitive choice of professional pianists. Length: 7'6"